What Happens During Phoenix Domestic Violence Trials | Az. This is the next post in my series discussing what Phoenix residents can expect from the legal process after being arrested for domestic violence. My last post explained the pros and cons of a pretrial diversion program for first time offenders. In this post I will be discussing the process leading up to trial and what a defendant needs to know in order to prepare. 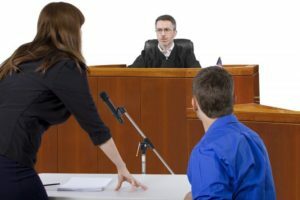 Many defendants do not realize that the bulk of a criminal defense attorney’s work occurs outside of the courtroom rather than at the actual trial. Of course the attorney will go to all of your pretrial hearings on your behalf, but the months leading up to a trial will be filled with your attorney gathering as many facts and as much evidence as possible to support your defense. The first step is to obtain the “discovery” from the prosecution. This may include police reports, witness statements, photographs taken by police, victim medical records, and evidence collected at the scene of the crime. This gives your lawyer a clear picture of what the State’s accusation against you is, why they believe you have done what they claim, and what their general case against you is going to be. This is only the beginning step of your lawyer’s investigation. Your counsel will begin to explore additional issues, and will launch their own investigation, after they have been provided with discovery by the prosecution. Your attorney will visit the scene of the crime and interview relevant witnesses, especially the police officers that were involved in you case. They may challenge and check the facts that the prosecution claims and use any discrepancies during trial. They will also analyze the details of your arrest and seek to keep any evidence which was illegally obtained out of court. For example, if police searched your home without a warrant following your arrest, and found a weapon, then your attorney can file a Motion to Suppress and request that the weapon not be entered into evidence by a Phoenix or Maricopa County Judge. Your attorney will prepare you as much as possible as to what you should expect at trial. If he or she intends for you to testify in your own defense then you will be well versed in what kind of questions will be asked of you by both your attorney and the prosecution. You will also have a general idea of how long the trial will last, what witnesses will be called, and how the prosecution will plan to portray you. Sitting calmly in trial while the prosecution paints you in a poor light can be difficult. Counsel will urge you to stay calm, keep your facial expression neutral, and to avoid displaying signs of anger or annoyance. This can be difficult, but it is important to remember that you are being observed and judged, in regards to your actions, throughout a trial. It will also be important to show respect to the Court and send signals that you are taking the process seriously. Your attorney will give you tips on how to dress professionally for Court and ensure that you arrive to the courthouse on time. If you are taking a domestic violence charge to trial then it is important to hire an attorney who is both an experienced litigator and someone you can trust. Contact my office today for an initial consultation. In addition to Phoenix I represent defendants in other Maricopa County cities such as Mesa, Glendale, Scottsdale, Chandler, and Gilbert. I also assist Pima County residents in Tucson.